Medical Lessons – Who Was Nurse Mary Jane Seacole? Who Was Nurse Mary Jane Seacole? On the bus last week I was reading the latest New Yorker and came upon a short, front-end piece by Ian Frazier on Mary Jane Seacole, a Jamaican nurse who tended wounded soldiers in the Crimean War. As best as I can recall, I’d never heard before of Florence Nightingale’s colleague. Moving beyond the certainly fact-checked details on the legend of Mary Seacole, I learned that there is a Society for the Advancement of the Caribbean Diaspora, based in Brooklyn, a borough in the city where I live. And confirmed that March was Woman’s History Month. Seacole’s autobiography, Wonderful Adventures of Mrs. Seacole in Many Lands, was an 1857 best-seller, Frazier wrote. According to the University of Pennsylvania’s Digital Library, James Blackwood, a 19th Century London publisher based at Paternoster Row, put forth her story. So much to learn here. 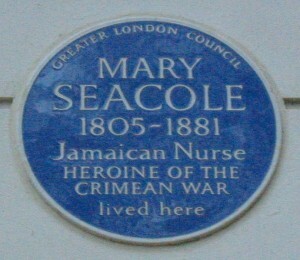 I wonder if anyone’s written a Seacole biography other than her own? Thanks so much for providing this information!